This time last year I has just had a growth scan and the girls got to see their new sibling in 3D. I remember that cold drive to the private clinic for the scan, excited to see my baby and the realisation that this was the year baby would arrive. 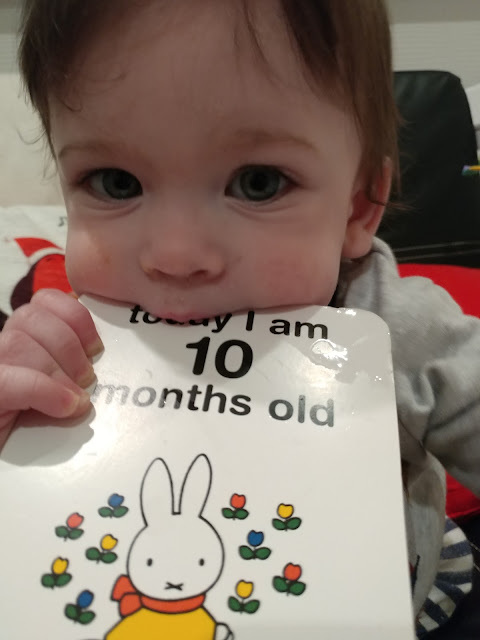 Now a full year later I have a 10 month old and very soon a first birthday will be upon us. It also recently dawned on me that as Little Man was born right at the very start of March his birthday is sooner that we think as February is not a full month, well not really, so I might have to start planning very soon! This past month has been documented daily on our YouTube channel as we undertook Vlogmas. 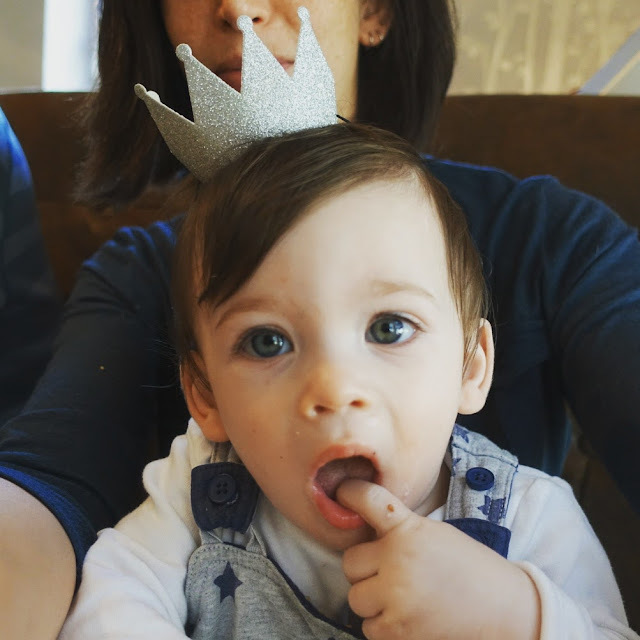 It has been great watching Little Man grow each day in these videos, and whilst they may not be directly about him he still features in them. This month has seen Little Man gain a new tooth, so we now have 5 and by the looks of it another on its way. Little Man has had all the cold and flu bugs going so it has been a very snotty month too. I now have a climber on my hands, he can climb onto chairs and tables, climb up stairs and basically climb onto or over anything that stays still long enough. 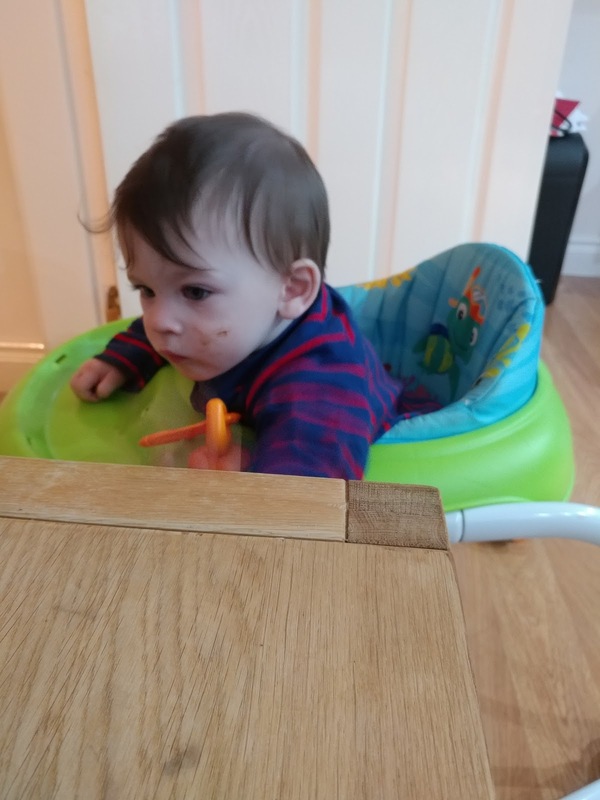 He is super speedy fast in his baby walker and loves whizzing around and opening cupboards! He does a fantastic three point turn in his walker and loves to chase the dogs and his sisters. Whilst he can crawl he prefers to walk with objects so will crawl to an item to pull himself to standing. This past month has been all about working out how to get back down again, and he has now mastered sitting back down after standing up. It has been so sweet watching him work this out. 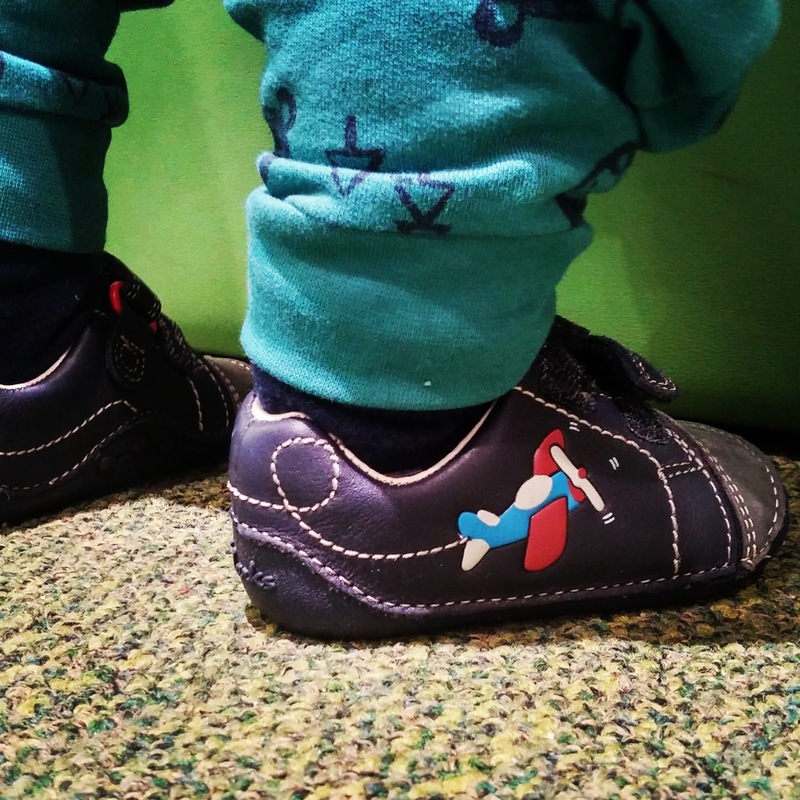 Due to Little Man walking with furniture he now has his very own pair of shoes. This first pair in the photo we had to take back as he refused to walk in them, his current pair he prefers much more and will walk with them on! As well as walking Little Man is a chatter box. 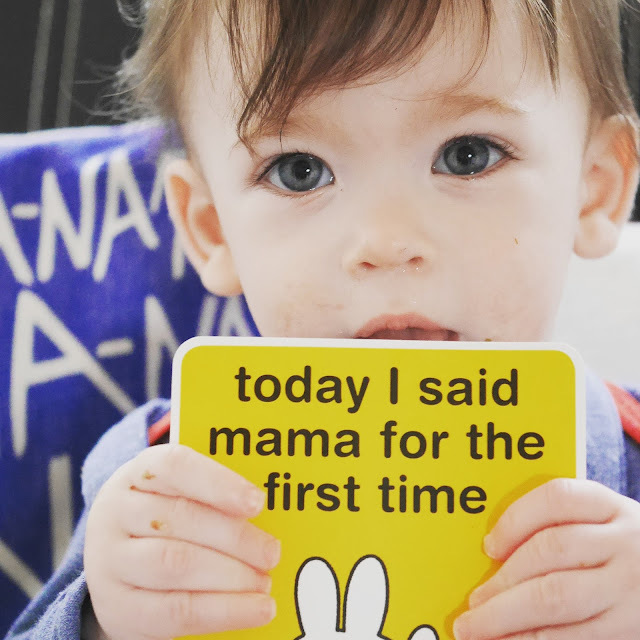 He wakes up every morning and says 'Hiya' and then starts chatting away and a few days ago he said 'mama' and now I can't get him to stop! He also loves to blow raspberries and will often answer a question you ask him by doing so, which can be rather comical. He gains a very confused look when you roll your tongue or stick your tongue out at him, neither of which he can do yet but he is working it out. Sleeping is not one of Little Mans strong points, but then his sisters don't sleep either. He does like a nap around 11ish and will nap for about 2 hours but then gets tired around 4/5 and if he does nap then he will not go to bed until around 11, and if he doesn't nap then he sleeps 6-8 ish and then is up until 11! Either way it makes for an interesting evening. He gets up at least twice a night and wakes up around 7.30 am every morning demanding breakfast. I am trying to get him to sleep in his cot but he simply refuses, and then wakes up his sisters who then also refuse to go back to sleep. We do have a good routine with Little Man, which is something neither of the girls had. He eats and sleeps around the same time each day, and he adores his bed time routine refusing to sleep if he doesn't have a bath. 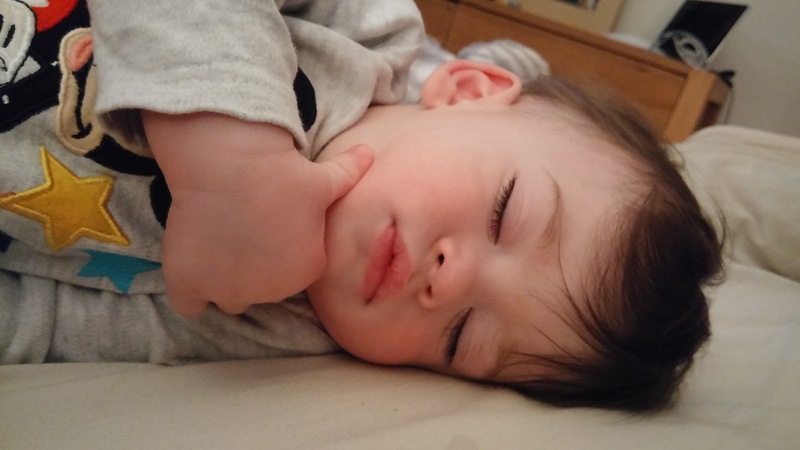 Little Man has started with some patches of dry skin, which is how my eldest eczema started and so I have been using the new Aveeno baby range with him. I met the Aveeno team at Blogfest and they kindly gave me some samples to try. The Aveeno baby range has been specifically designed for a baby's skin. Not only does it help to moisturise the skin but it has been designed to cleanse, soothe and protect delicate baby skin too leaving it healthy and leaving Little Man comfortable. I put some in his bath and he loves making lots of bubbles with it. After his bath I massage the emollient cream into his skin before putting on his PJ. He loves this routine and it seems to help keep dry skin under control. One of the issues I have with Little Man and his sleeping is he does not like his sleeping bag. He moves to much for a blanket and he gets himself tangled in his sleeping bag. 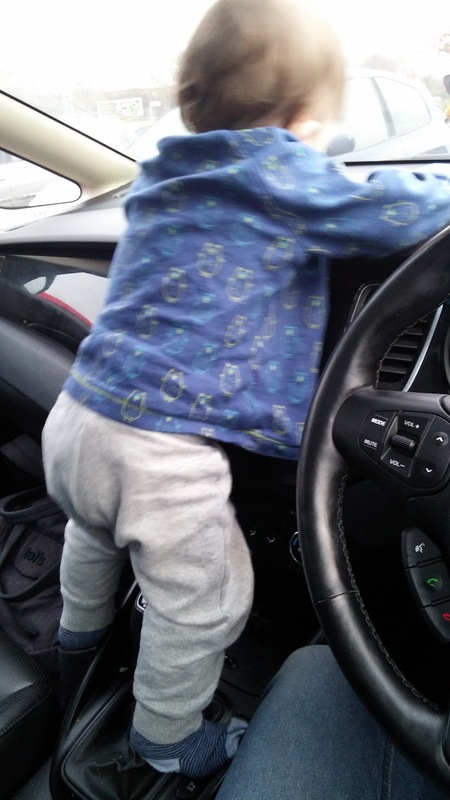 He likes to move his legs and cannot do this so gets frustrated. Dry, itchy skin on top of this would mean a very unsettled night so I use the Aveeno cream to help combat this uncomfortable feeling. Little Man has a huge obsession for water and can be found anywhere there is running water. He knows where the bathrooms are and will crawl/walk to them and try and open the door. He gets over excited when he pulls himself up to the bath and does lots of excited jumps, his little legs then try to climb the sides to get in. 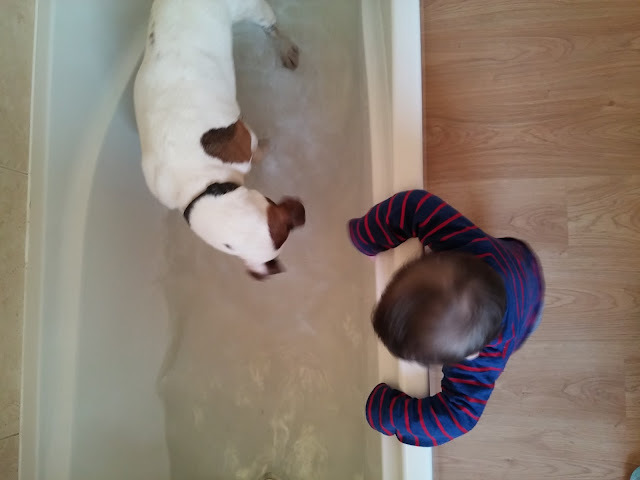 Even when the dog is in the bath he still wants to get in! Little Man now wears size 9-12 month clothes and even some 12-18 months clothes. At our last health visitor appointment he had regained his birth line, and that is no surprise as Little Man adores his food. He is fussy that it has to be the same as what we are all eating but other than that he eats most things, including sprouts at Christmas dinner. I still find it hard to believe that Little Man has blue eyes, they have changed slightly to a blue/green but given a family of brown eyes it is such an amazing change. He has such a happy and cheeky personality. He will spend ages focusing on one toy, rather than playing with multiple toys. He much prefers to figure out how one toy works before moving on to another. Little Man seems fascinated with screws and you often find him with his finger working out how to unscrew the screws. His other fascination is with posting things and he posts his toys down the backs of chairs on purpose. His pointer finger gets used the most, he likes to point at things, put the pointer finger into things and use the pincer grip whenever possible. I have a feeling I am going to have to watch him very carefully as he gets bigger! I cannot wait to see how my beautiful blue eye boy develops over the next month! 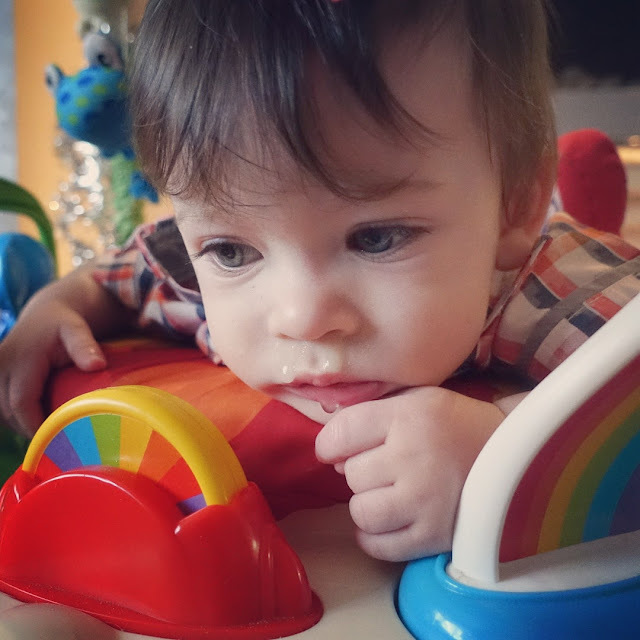 To celebrate a new year and the countdown to a first birthday I am giving away a teething ring from Gumigem. The colour and style will be sent from Gumigem directly, to enter simply follow the details on the widget below.